My kids and I are together all day, and my husband is spending his evenings getting our new house ready. By the end of the day we're all cranky and tired of each of other. We needed something something special to break things up, so we started a new tradition of enjoying hot chocolate between baths and dinner. This week we have taken some time to notice what happens to the marshmallow after it goes into the hot chocolate. Phase change in progress! It is turning from a solid to a liquid. Why? 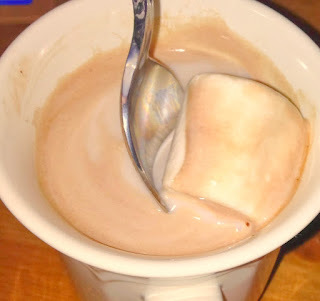 Because heat energy is transferring from the hot hot chocolate to the marshmallow. Where is it going? Into the hot chocolate. The principle of Conservation of mass, it had to go somewhere. Since Mommy likes her hot chocolate hot, not just warm, the energy level known as temperature is higher in her drink. The greater the difference of energy between two objects the faster the energy flow. This is a common theme in systems trying achieve equilibrium. Hope you are finding good ways to stay warm (or cool if you're further south) wherever you are!